*OVER* Bluetique Gift Certificate Giveaway! Fall is upon us and so is the chance to sport some amazing fall fashion! 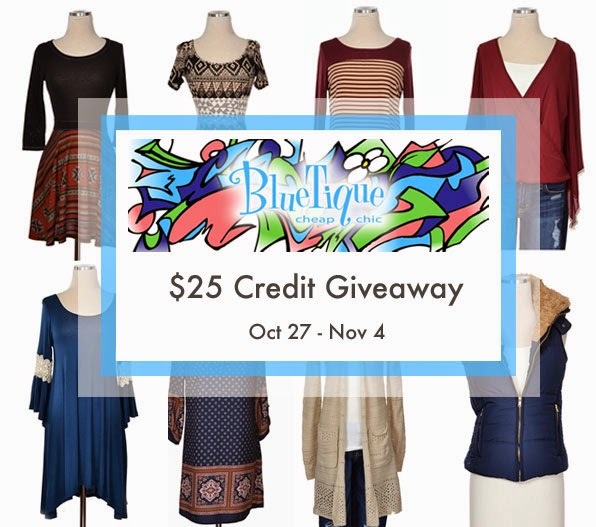 Thankfully Bluetique is ready with tons of long tunic type shirts, knee length cardigans, comfy sweaters and fall vests that they are just begging you to strut around in boots and leggings and to kick up some leaves. You can read a full review of the Bluetique from Brittney on Dandy Giveaway. This giveaway will run from Oct 27 – Nov 4, and will end at midnight EDT. It is open to US residents, ages 18+. Entries will be verified, winner will be notified via email and will have 48 hours to respond and claim prize or another winner will be chosen. For questions or concerns email DandyBritt@gmail.com – also consider adding that email address to your safe list, as winning email notification will be sent from it. I'd love to buy the According to Liz Cardigan in the Slate color, really modern and cool.